[S189] Henry A. Ford and Mrs. Kate B. Ford, compiler, History of Hamilton County Ohio with Illustrations and Biographical Sketches (Cleveland, Ohio: L. A. Williams & Co., 1881), p. 248: "Walter Johnson settled in Anderson township in 1804, where his death occurred eighteen years after. . . . His wife was Anna Bridges. 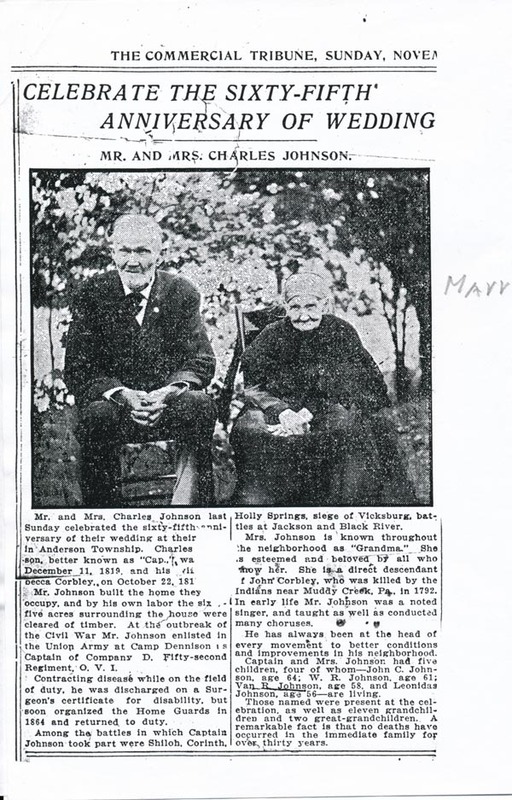 The surviving members of his family are Rebecca Cox, W. W. H.Johnson, Franklin Johnson, Hannah Cord, Charles Johnson, Walter R. Johnson, Anna Johnson, and Sallie Norton." [S189] Henry A. Ford and Mrs. Kate B. Ford, History of Hamilton County, Charles JOHNSON was born in Anderson township, December 11, 1819, and married Rebecca CORBLY October 17, 1841. He is the lather of five sons, four of whom are living. He is of Scotch extraction on his father's side, who came from Pennsylvania in 1790, and settled in this county. His mother is of Yankee descent, was Anna BRIDGES in her maiden days, and was the first white child who crossed over into Anderson township and settled permanently with her parents. Mrs. JOHNSON is of German origin on the line of her father, and from her mother received English blood. By trade Mr. JOHNSON is a carpenter, but is now particularly engaged in farming and fruit-growing. He is one of those men who obtained his knowledge outside of colleges and academies, but has that rare culture which comes from experience. During the early years of the war he raised a company of volunteers, was elected captain, and served with his men in the Seventieth Ohio regiment for three years. Among the township offices he held are such as justice, school director, and other positions, which show the estimation in which he is looked upon by the people. [S20] 1850 U.S. Federal Census. Charles (31), b. OH, farmer; Rebecca (32), b. OH. [S19] 1860 U.S. Federal Census. Chas (40), farmer; Rebecca (42); both b. OH. [S18] 1870 U.S. Federal Census. Charles (50), farmer; Rebecca (51). [S17] 1880 U.S. Federal Census. Charles (60), farmer; Rebecca (62). [S5] 1900 U.S. Federal Census. Charles (80), b. Dec 1819, farmer; Rebecca (83) [sic], b. Oct 1817, 4 children, all living; marr. 59 yrs; all parents b. OH. [S1628] FindAGrave.com, online findagrave.com, shared standing memorial. Capt. 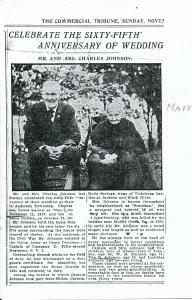 Charles Johnson, Co. D O.V.I, 11 Dec 1819 - 5 Feb 1908 / Rebecca his Wife, 22 Oct 1817 - 3 Feb 1908. Narrative: Children: Walter R Johnson (1846 - 1935), Leonidas Johnson (1849 - 1938); bur. Mount Moriah Cemetery, Withamsville, Clermont County, OH. Memorial# 15763805, maintained by John Tippet, created by Shanna Nicole (inactive), photo added by Paul (Dakota) S.
[S189] Henry A. Ford and Mrs. Kate B. Ford, History of Hamilton County, p. 415. [S191] Ancestry.com Tim Johnson Ancestors, timjohnson925, owner, online \Ancestry.com\. Hereinafter cited as Tim Johnson Ancestors. [S1819] Ohio Deaths, 1908-1953, index and images, online FamilySearch.com, death cert. of Leonidas Johnson.